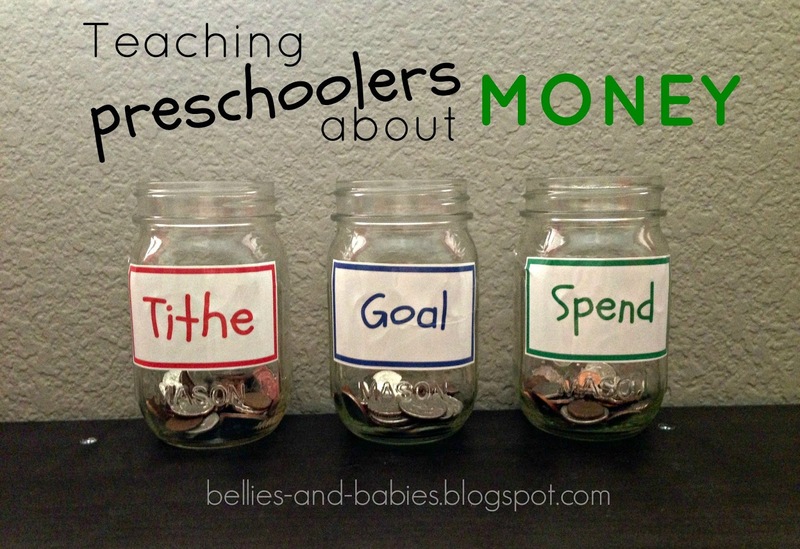 Let me start by saying that I am not a money expert or a preschooler expert. I just want to share what we are doing to help teach Jax about money. It may or may not work for your family. But if it does, great! And if not, I'd love to hear what is working for you! Jax has had a piggy bank for a few years. Ryan got him a cool soldier one in Thailand, then Ryan's parents got him an actual piggy bank for Christmas last year. It's really cool because it counts the money as it you put it in, so you always know how much you have. When he was younger, this was all he really needed. But he's almost 4.5 now, and over the last few months we've started to struggle with teaching him how to save, and also how to give some of his money back to God. He was really resisting both of those things. He wanted to keep all of his money and use it to buy toys. So I knew we needed to figure out something different. I created these simple, color-coded labels (you can download them for free HERE! ), taped them to mason jars that I already had, and VOILA, a brand new money system! 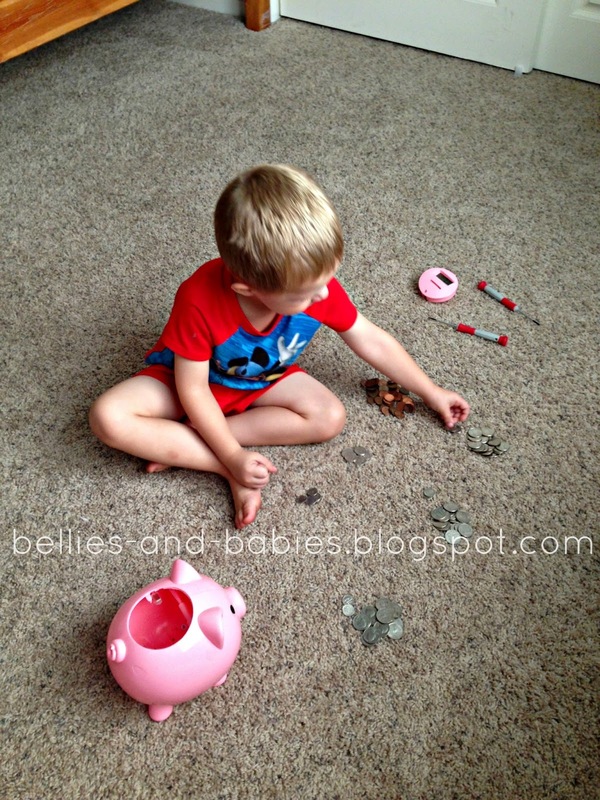 So to put this into action, Jax and I dumped his piggy bank out onto the floor. We separated the coins into like piles (quarters, dimes, nickels, pennies), and I took that opportunity to discuss what each coin was worth and how many of each equaled the other ones. After we talked about that, we took each pile and put one coin at a time in each jar. One by one by one until all the quarters were gone, then we moved onto the dimes... and so on until all the coins were in the new jars. After all the money was separated, I talked to Jax about how the system was going to work. 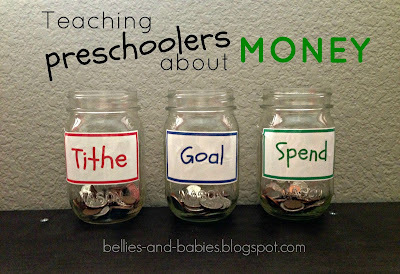 *For the tithe jar- I explained the importance of giving some of our money back to God. I explained how everything we have comes from Him. I reminded Jax how we always say thank you to God when we are praying, and that this was another way to thank Him. I also told him that the Bible tells us how to handle our money, and that this was an important part of it. 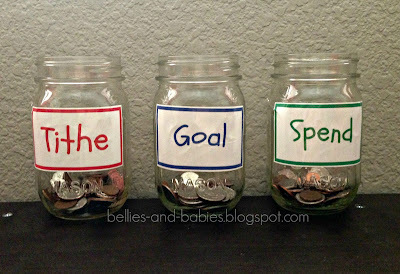 *For the save jar- I let him pick something to save toward. He picked a trip to ChuckECheese for dinner and games. I told him that once we tithe, then we need to put money aside to save for bigger things. I explained how Ryan and I use this savings for things like a new car or furniture. And that we also use this in case anything unexpected happens and we need some last-minute money for something important. 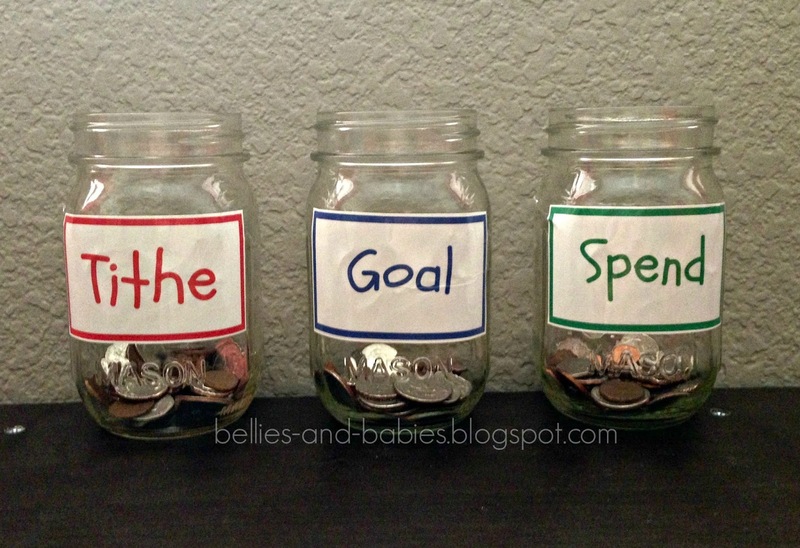 *For the spend jar- this is his discretionary fund. He is allowed to use this money however he wants, as long as Ryan and I approve of the item/timing. I explained to him that the more he adds money and the less he takes out, the more he will be able to afford. He immediately decided he wanted to go buy something at Target (we were headed there that morning), so I explained to him that it was fine, but once he spent his money, it was gone. If he found something else he wanted, then too bad. So we decided together that he would bring $1 to get something from the dollar section. I'm going to let him be in control of his spend jar, and hopefully this will be a great lesson in immediate versus delayed gratification. He's a spender (what kid isn't?? ), so I'm pretty sure that money will be gone quickly. For future money, he will put everything in his wallet (which just stays at our house. Ha!) until it is full, then we will dump it out and do the same thing that we did with emptying the piggy banks on the first place, separating the coins into each jar, one at a time. I pray that these money lessons will be good lessons that stick. That they will begin to prepare Jax for more responsibility as he grows. And that someday, his future wife will thank us for it!